Mum lent me this book ages ago and it took me a long time to get around to reading it (to be fair, I was reading the mammoth The Wines of Burgundy at the time). 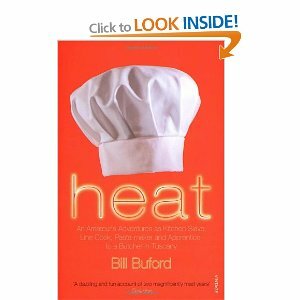 Heat is the autobiographical story of Bill Buford, a food lover – strictly amateur – who managed to score himself a “kitchen slave” position with New York’s Mario Batali. American readers, in particular, will know Batali from the Food Network where he’s on Iron Chef America and is the host of Molto Mario. Buford began his adventure in an unpaid role, working in Batali’s Babbo restaurant on weekends. It seems like it didn’t take long for him to work his way up to more and more hours and more and more responsibility. He eventually heads off to Italy for various culinary adventures, culminating in spending a lot of time in Tuscany as apprentice to a butcher. This is an entertaining book and I suspect you have to have more than a passing interest in food to enjoy it, but it is quite a lightweight read. And that’s not a bad thing – this book would make perfect aeroplane material for long haul flights and was a great antidote to the heavyweight (both physically and mentally) book on Burgundy. One thing that puzzled me throughout the book was the stark absence of any mention of money, or even extended family. Buford mentions his wife a little – especially towards the end when they are in Italy together – but rarely mentions how his forays into the professional kitchen impacted his family’s finances and well being. I don’t know about you, but if I started working weekends in a professional kitchen Andy might have something to say about it – especially if I ended up quitting my job and gallivanting off to Italy. This makes Heat a very personal story because we do find out a lot about how Buford’s experiences changed him, but it’s also an insular story, because we never get a sense of the emotional relationships he has with anyone outside the world of food. Criticisms aside, this is a perfect book for reading while you’re letting your Christmas dinner settle.